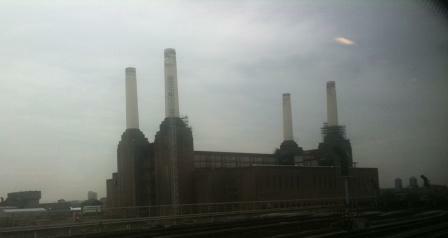 The upside down table like power station at Battersea has now been out of commission for many years. It has been a South London Landmark and always brings a smile to my face when i travel past it on a train from Victoria Station. The power station was built to burn coal, that highly polluting and emission creating fuel, but was ahead of its times as the surplus heat that power stations always generate was siphoned off into social housing to provide then with free heat for space and water. These days power stations are located far from where people live and the surplus heat energy is wasted. Several businesses have thought about acquiring the power station and turning it into – a conference centre, or a theme park with rides or even a casino with shopping but none of the plans have been economic and tyhe power station, listed as a protected building for its design is gradually crumbling. My idea about the building is simply to turn it back into a power station, but this time burning natural gas. It could also be used for gas storage; we are still very short of having stores of natural gas in the United Kingdom and the old power station could serve this purpose. As power stations goes the site is small, but small is beautiful. A new gas burning power station could be built to the highest environmental standards and there are plenty of nearby houses that could benefit from the surplus heat. It could easily be metered and sold as heat, recreating a real environmentally friendly district heating system in the heart of London. The cost of all this infrastructure would be significantly less than the cost of a tunnel for the proposed high speed rail link to Birmingham and would have far greater environmental benefits. EU renewable energy targets – renewable heat is part of the solution, not the problem, dummy! There has been a lot of news in the past day. The race for presidential candidates in the United States has got very interesting, particularly with Mrs Clinton making a strong showing to win New Hampshire. In the United Kingdom there are new measures that will be introduced in an effort to halt or slow down the worrying amount of people infected in hospital where they go to get better. Somehow, amidst all this news the announcement that the Cabinet had unanimously agreed to approve new nuclear power generators has gone relatively unnoticed, although in the longer term it is probably the most important piece of news this week. Gordon Brown claims that this decision is a “fundamental precondition of preparing Britain for the new world”, but has refused to answer questions about the detail of what will happen. It is nice to see Mr Brown is concerned about preparing Britain for the new world, but his rhetoric is empty. I have news for him; the “new world” that he seeks to prepare us for already exists. His party has been in office for ten years and have in that time neglected the issue of energy and in particularly neglected to secure any long term energy independence for us in a world where nations are competing for limited supplies of fuel. Apparently this decision will be announced not by the Energy Minister Malcolm Wicks but by the Business Minister, John Hutton tomorrow; odd, that, to announce the decision twice – once to the media and once to Parliament. They can save a lot of time by only announcing it once; I am sure that Parliament follows what is in the media and that the media follows what is said in Parliament. This double announcing seems a gross waste of energy. The decision to build new nuclear power stations is incompetent, dishonest and dangerous. It is incompetent because nuclear fuel is a finite resource which will probably last no more than seventy years, and possibly less as China and India build new nuclear power stations that will draw on the world’s supply of uranium. In these circumstances by the time the power stations are built we will have only secured some electricity for a limited period. Nuclear power will only secure electrical energy supplies, and although electricity can be used to create heat that is a very expensive way to use it. It is dishonest because the decision will be dressed up as an environmental decision, and all kinds of claims will be made that nuclear energy (when they mean nuclear electricity) does not emit carbon dioxide. The process itself does not; the nuclear fission provides heat which drives turbines which generate electricity but mining the uranium is a carbon intensive process, particularly in places like India where when they mine uranium and then process it the overall carbon foot print is as big as an oil burning power station. It is also dishonest because decommissioning will involve building huge underground concrete bunkers to store the waste fuel which in itself is a very carbon intensive programme. It is dangerous because the new generation of nuclear power stations will be over twice the size of existing power stations and will contain a great deal of dangerous material. It is also dangerous that we are going to build more nuclear power stations without having invented a process for disposing of the waste safely, other than by burying it for tens of thousands of years. This decision is being dressed up as the government making a tough long term decision. Balderdash. It is an easy option – the only tough part about the decision is the need to explain it to a sceptical public and trying to figure out how we can pretend that the decommissioning costs will actually be paid by the plant operating companies when in reality they will be paid by the public purse. A tough long term decision would be to require every home to have some form of microgeneration from a non carbon or a low carbon source, now. A tough long term decision would be to build a tidal power station in the Severn Estuary. A tough decision would be to require all new homes built to have solar water heating. A tough decision would be to tax the people that use the most energy by having progressive energy price bands. A tough decision would be to ban car engines above a certain size. Gordon Brown is not making any tough decisions about these and a host of other measures relating to energy. So when you hear the spin that the government will put on this decision ask them why they are making easy short decisions not tough long term ones. And also ask them why, if the nuclear power stations that they will be building will be so safe why they won’t site them next to the Houses of Parliament, so that they may deliver the electricity that they produce quickly to high population centres without suffering the low transmission losses, and use the surplus heat generated to provide people nearby with a district heating scheme.